If you're thinking about buying a charcoal grill, especially if you've never owned one before, it's a good idea to consider what you're planning to use it for. Is your goal mainly burgers, steaks and hot dogs? Do you aspire to barbecuing racks of ribs or possibly a turkey? And what about smoking? If you're just starting, your ambitions might not go beyond being successfully preparing a meal on the grill. And of course your budget, as well as how much space you have, will also factor in. Here's a top-down view to help you make sense of your options. Probably the main reasons for choosing charcoal over gas are simplicity and affordability, and of course the two go hand in hand. A charcoal grill is essentially a container for coals with a rack above it and a lid. By contrast, a gas grill is a complex creature made up of burners, hoses, tanks, valves, plus some sort of ignition system. Besides being extra stuff to replace when it wears out, it's also just extra stuff to think about. Did you tighten the propane tank all the way? Is there a leak in that hose? If you're prone to worrying, the knowledge that a bag of charcoal isn't going to spontaneously explode could be a great comfort. To be sure, cooking on a gas grill is simpler, but your setup is more complicated and expensive. So that's the trade off. When it comes to setting a certain temperature, with a charcoal grill that's an inexact consequence of how much charcoal you use and how you have the air vents adjusted. With a gas grill, you simply turn a knob. On the other hand, gas doesn't taste like anything. With a charcoal grill, even using standard briquets, there is some amount of flavor being imparted to your food by the smoke. And when you start using lump charcoal and wood, that flavor factor becomes even greater. Another reason for choosing charcoal as a beginner, which is that once you know how to grill over charcoal, you can also grill over gas—but the reverse is not necessarily true. It's like learning to drive on a stick shift. Once you've mastered that, driving an automatic is no problem. 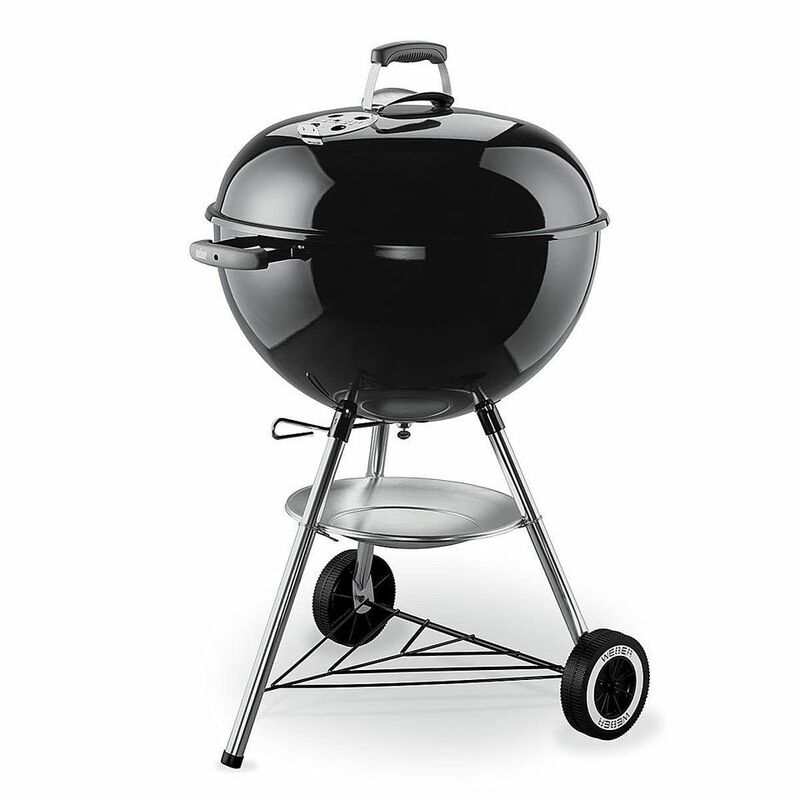 There are three main types of charcoal grills: the ceramic, the barrel and the kettle grills. All three of them are capable of grilling, barbecuing and smoking, although each one has its particular strength. Kettle grills are relatively small, typically around 22 inches in diameter, or 363 square inches, which means you can comfortably cook 12 to 15 burgers on it without overcrowding. If you're just learning to grill, that is probably the most food you would want to tackle right away anyway. Even so, there are larger kettle grills available, with 26 inches also common and the biggest models surpassing 36 inches. The near-spherical shape of a kettle grill serves to retain and reflect the heat inside so that the food cooks evenly. They're pretty easy to maintain, particularly the ones with removable ash receptacles. With basic models starting at around $100 (or sometimes less), not only are kettle grills affordable, they're are also versatile. Whatever type of cooking you want to do, from high-temperature grilling to low-temperature barbecuing as well as smoking, a kettle grill will do it. Nevertheless, if all you're planning to do is grill, a kettle grill (unlike the others) would not be overkill. Barrel grills are even bigger, usually about 36 inches long with a primary cooking area of 435 square inches, which is enough to fit and are specifically designed for smoking as well as grilling and barbecuing. Picture a 55-gallon steel drum that's been sliced in half lengthwise. The coals and/or wood go in the bottom half and the top half forms the lid. It'll have air vents and a chimney, and a wheeled stand to move it around and so on, but that's the basic design. Barrel grills will often feature an additional warming rack in addition to the main one. And since it's bigger than a kettle grill, you can grill, barbecue or smoke a larger amount of food in it. But again, if you're just learning to smoke, a kettle grill is a better place to start since if it doesn't work out you can always go back to grilling. A barrel grill is a bigger piece of equipment, and it's also a bigger commitment in terms of money and space. Figure $200 and up for a decent one. And yet for the money, if you're looking to grill or smoke a large amount of food, a barrel grill offers a very generous capacity for far less than what you would pay for the equivalent size of ceramic grill, which is what we'll discuss next. With the mid-range models starting at around $700, ceramic grills are the most expensive type of charcoal grill, and thus probably not something you'd consider if you're just starting out. But their solid ceramic construction offers superior heat control (a crucial factor particularly if you plan to grill in extreme winter) as well as the ability to cook at temperatures from 200 F at the low end, which is perfect for barbecuing and smoking, all the way up to 500 F and even hotter, which can come in handy if you're interested in cooking a pizza on the grill.